Song of Olga: Olga Jean sometimes wondered what people saw when they looked at a newspaper. 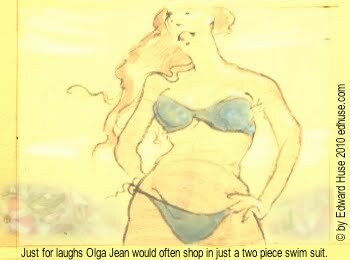 Olga Jean loved shopping for cookware in bikinis with the girls. they were such cut-ups. 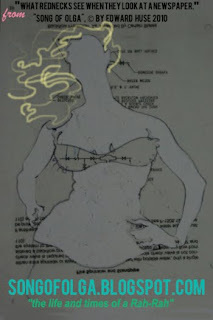 image © by Edward Huse 2010 all RR buy a lovely real life artwork based on the adventures of these two young people today! Sing Goddess, a Song of Olga, the Countryman's daughter, firm of flesh and strong of bone, Olga, a Song is Sung, a Song of Olga.
" ... plaid skirts with oversized safety pins, penney loafers, crisp shirts with peter pan collars, sensible sweaters or wool highlander jackets, and a lot of secret time spent with the girls in Oregon. songofolga.blogspot.com ... "
" ... whatever was I supposed to do anyway with that if not to just start another blog, oh well, for some time I had wanted to do something with the "big goofy natural gals with a lib arts degree from back east" memories, souveniers, stories, imagery and other artifacts anyway ... "
Olga Jean sometimes wondered what people saw when they looked at a newspaper. She was funny that way. Labels: olga jean blond newspaper redneck "Song of Olga"